Subscribe today for as little as $4. One log-in. One website. One source for energy news, analysis and insight. Hart Energy’s newly restructured website combines a decade’s worth of award-winning content previously spread across OilandGasInvestor.com, EPMag.com, UGCenter.com and MidstreamBusiness.com into one easy-to-access and search website. 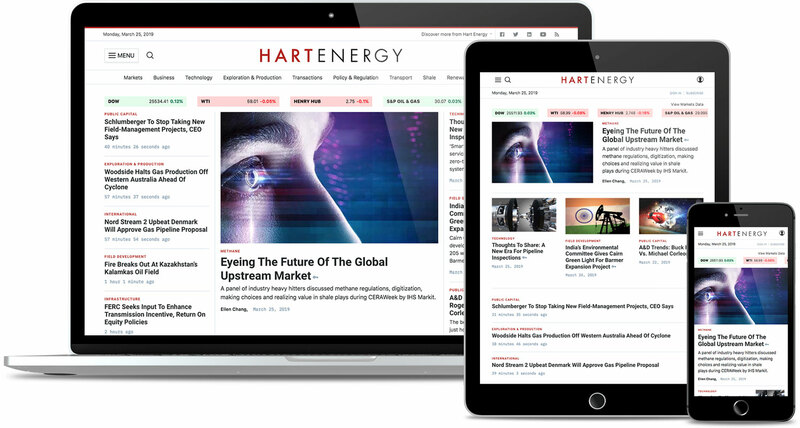 The new HartEnergy.com provides financial information, shale play and new technology updates plus much more. *Billed at $49.99 + tax monthly after 4 week introductory offer period. Billed monthly. Cancel anytime. A print and digital subscription provides you with access to two of the energy industry’s most comprehensive and trusted sources for industry news. HartEnergy.com and Oil and Gas Investor magazine. Each month you’ll enjoy Oil and Gas Investor magazine. It delivers in-depth analysis on exploration trends, strategic financing, investment opportunity, management best practices, plus interviews with key industry players. Get the critical insight you need with our classic print package. The latest on technology, technical solutions and E&P strategies. *You must be pre-qualified to receive your free subscription and to download the App.